Solar heating for family pools is a reliable technology. After water from your pool passes through the pump and filter, it is sent to the solar panels and then returned to the pool at just the right temperature. Using the Sun’s power heats the pool without the expense of a gas heater and lengthens your swimming season by months! The result of getting a solar pool heating system is that Spring is no longer a time for sitting around waiting for the pool to warm up. Fall is more months for swimming, not when you haul out a winter pool cover. And summer is when you experience perfect water temperatures, just as you and a family like it. For additional information about how to have pool climate control with a Heliocol solar pool heating system, connect with Solaron in Loomis at 916-631-9293. 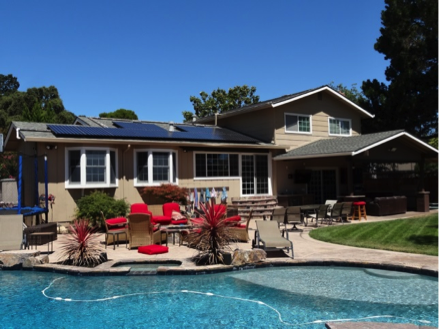 Our agents will come to your household, consider the landscape and the pool and provide a no-obligation consultation for a solar pool heater installation. Trust Solaron for advanced products in solar pool climate control! Solaron uses energy for life!